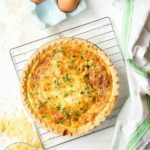 Classic Quiche Lorraine is a flavor-packed bacon, cheese and onion quiche. This recipe uses a frozen pie crust so no pie crust prep is required. Gluten-free or regular pie crusts may be used. Blind Baking the frozen pie crust: Place the frozen pie crust on a rimmed baking sheet. Line the inside of the pie crust with a piece of foil covering the crust and extended a few inches on either side (refer to the photos). Fill 2/3’s full with pie weights or dried beans. Bake the prepared crust for 20 minutes. Carefully remove the foil and weights, pierce the crust bottom and sides with a fork and bake for 5-10 additional minutes. While the crust is blind baking, cut the bacon into 1/2-inch pieces. Refer to Bacon Prep Shortcut in blog post. Cook over medium-high until the bacon is cooked but NOT crisp. Remove to drain on 2 layers of paper towels. Remove all but 2 teaspoons of the bacon drippings from the skillet. Add the onion to the skillet on medium-high heat and cook until transluscent. Remove and add to the bacon. In a medium mixing bowl combine the eggs, half & half, nutmeg, white pepper and salt; whisk to combine. Add 1 cup of the grated cheese and stir together. Once the pie crust has finished blind baking (leave it on a rimmed baking sheet for easier handling and stability when baking), sprinkle the bacon and onions evenly into the crust. Pour the egg mixture on top, stirring it if necessary to have an even distribution of cheese. Sprinkle the remaining ¼ cup of grated cheese on the top followed by the sliced onions greens. Bake for 30-35 minutes on 350 until golden brown on top. NOTE: the middle may jiggle slightly but will solidify when cooling (a knife may be inserted in the middle and should come out clean). Cool on a cooling rack for 15 minutes before serving. May be served warm or cool. For best flavor after refrigerating allow the quiche to come to room temperature.